I have been wanting the new 6th generation iPod Nano since I first saw the commericial and I finally was able to get one. I had been saving up $10 Best Buy Gift Cards through a promotion at work I was able to take advantage of. Watch a one hour product update webinar and get a gift card. A few months of watching updates and I had been able to accumulate 18 cards…. Cards in hand, I went to my local Best Buy thinking the poor cashier that rang me up would most likely cuss me for having so many gift cards or thought I somehow managed to steal them. To my surprise the cashier was a younger girl that seemed excited about seeing so many cards, in fact she even hollered at another cashier to check it out as she fanned the gift cards in her hands like some playing cards. I think she said it was a store record for number of cards on a single purchase. 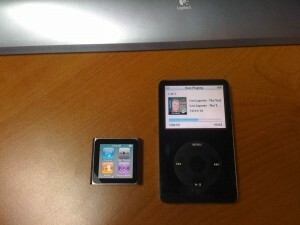 After using the 18 cards and a 10 Best Buy bucks coupon I only had to pay just a tad over $5 for my new iPod 16GB Nano. I am really thinking the smaller size will work great for working out in the yard and I will not have to keep re-tightening the arm band for the 30GB ipod I had before. Looking forward to giving it some good use.